Bake dinner rolls as directed on bag. Cool completely, about 10 minutes. With serrated knife, cut each roll in half crosswise. Spread cream cheese evenly on cut sides of roll halves. Place 2 turkey slices on bottom half of each roll. 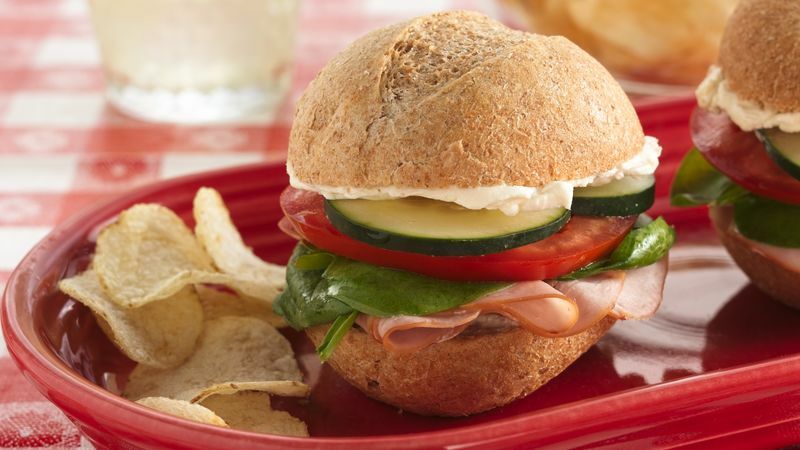 Top each with one-fourth of the spinach, 1 tomato slice and 2 cucumber slices; cover with top halves of rolls. Add a few finely chopped cranberries or spread the dinner rolls with a bit of cranberry sauce to jazz up this out-of-the-ordinary turkey sandwich.